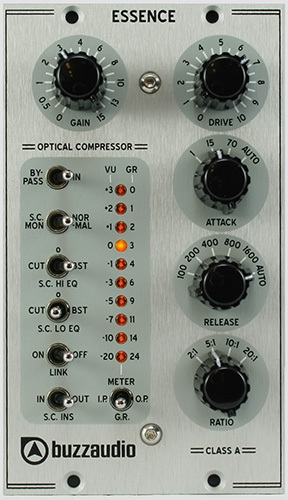 The Essence is one of the very best 500 compressors out there, and I'd go as far as saying one of the best compressors out there in any format. If you don't have 500 series, check out the SOC-1.1 and SOC-20, they are equally amazing and the SOC-20 has a real wow factor when you stand in front of it. Yeah, it's my goto box for bass now. If you push it, the transformers start to saturate and that can be really cool. I think I need a -6db line pad or something, though. The saturation only happens at really high levels (too hot for my Lynx Aurora A/D). I've got a Distressor, Summit Audio DCL-200 and Purple Audio Action, but the Essence is my fave for now. I'd love to try it on the 2-buss. We'll see if I can budget for another. These two [Elixir & Essence] are such a killer combination for my steelbody National that I had to get another set of them. I am only a musician, not a recording engineer, but I've been playing guitar for over 25 years and know what sounds good. These Buzz products are damn good. I am a fan! I have honestly tried to get the Essence to sound bad without success. Obviously, in only a few days I have not put it through all it's trials but it is exactly the 'tone-shaper' I hoped it would be and the build quality is first-class (I guess you know that!). The Essence is just fat and fabulous and along with the Elixir, this is definitely my new vocal/important track chain!